As I was looking thro ugh some of my random old interview notes this past weekend I found one that I felt would be worth sharing. A few years ago I sat down with George Lucas to discuss the empire he built, Star Wars, and some of his original thoughts for the Star Wars movies that never saw the light of day such as this idea to destroy the Separatist Droid Army. Yoda: Know how to destroy the Droid Army do I. Poison cookies will we feed them. C3-PO: But robots don’t eat cookies. From this point a good half hour of time was devoted to Obi-Wan Kenobi baking poisoned cookies with the padawans (young Jedi’s in training). After thousands of cookies were prepared. It was ordered by Yoda to have the Clone Army shoot the cookies at the Droid Army in the midst of a battle in hopes the droids would eat the poison cookies – thus rendering the Droid Army useless. A clear cut win for the Republic it would be. The day arrived and the Republic was engaged in a fantastic battle with the droids. Yoda gave the command and the Clone Army released thousands of cookies at the Droid Army, which they immediately began to crush beneath their robot feet as they continued forward to battle the Clone Army. 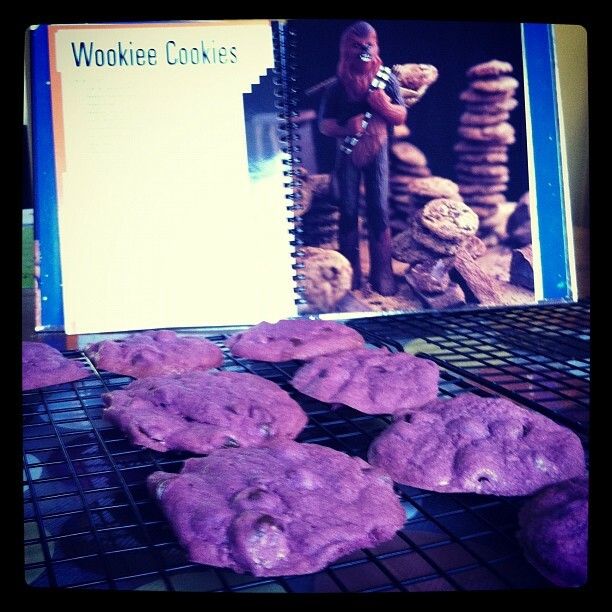 Jar Jar Binks: These cookies are most Gungan gooooooooooooooo…. ahhhhheckk. See also Darth Brother From Another Mother.